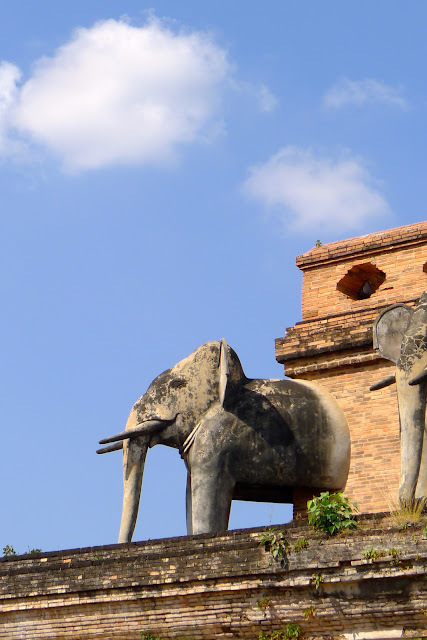 Come What May: Until We Meet Again, Chiang Mai! Until We Meet Again, Chiang Mai! 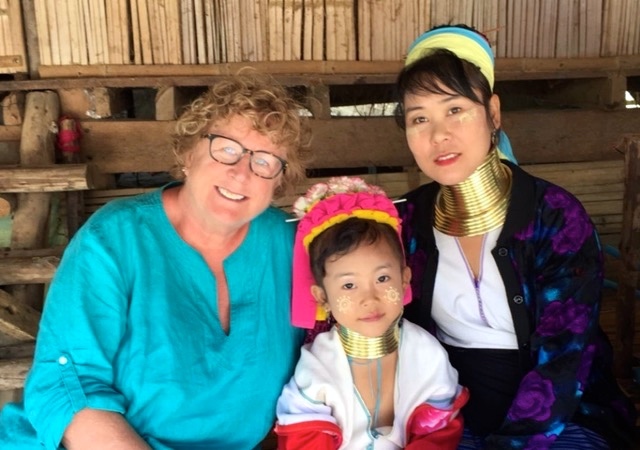 Our 12 days in bustling Chaing Mai have been fantastic. We've seen and done things we never imagined seeing or doing. We've met marvelous people and eaten incredible food. And consumed a lot of beer! 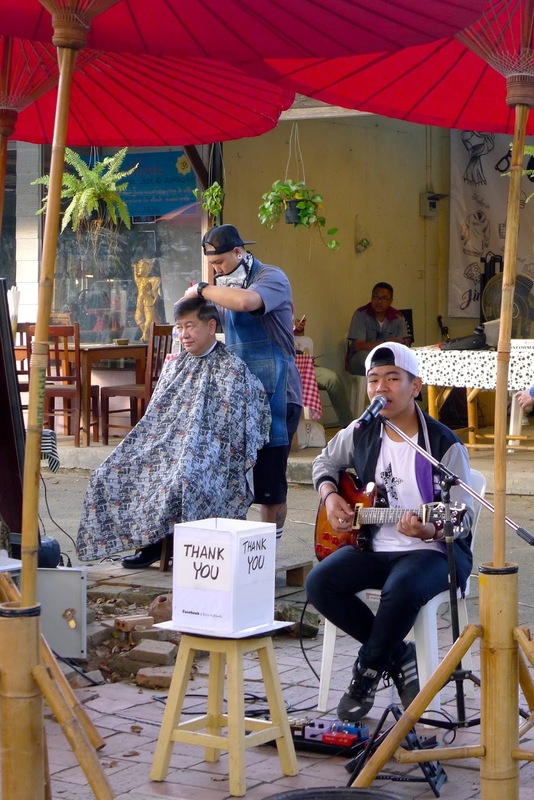 We had Thai massages every other day, the dogs entertained us and we ate our weight in Khao Soi soup. We really enjoyed house-sitting in the countryside, being able to listen to the frogs at night and the birds in the morning. What a wonderful experience it has been. We were feeling lazy one day, so we spent an afternoon at Huay Tung Tao Lake. Relaxing on the lake in a rented inner tube. The kids at the next hut were Canadian university students from Toronto. We heard each other speaking English and struck up a conversation. Joe invited them over to show them photos of his pizza oven and espresso machine. They all immediately 'liked' Joe's Cafe on facebook. We invited them to stay with us in Squamish if they ever found themselves in the Sea-To-Sky corridor. Food is never hard to find in this country. This woman's cart is just down the road from where we're house-sitting. 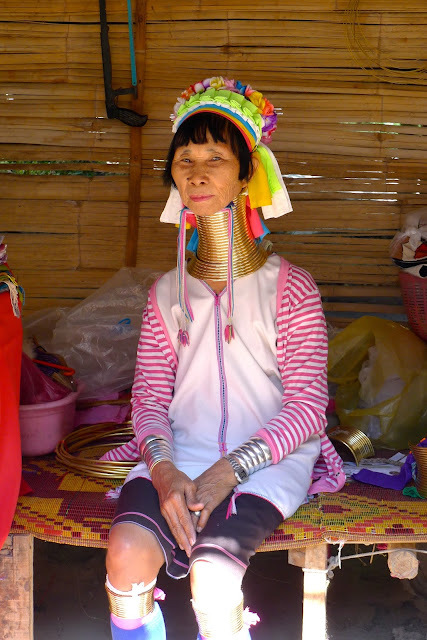 She spoke no English, we spoke no Thai. But she understood that we were hungry and fed us. One of her daughters crossed the road to fetch us a couple of beers from a guy who was operating a bar in his driveway. The sweet woman who cooked us dinner without exchanging one word. Jia Jang Market on a Sunday morning. Only at the Sunday morning market can you listen to a musician AND get your hair cut at the same time. This is why the food in this country is so delectable. All the ingredients are so FRESH! A sign on the steps at one of the ancient stone temples. 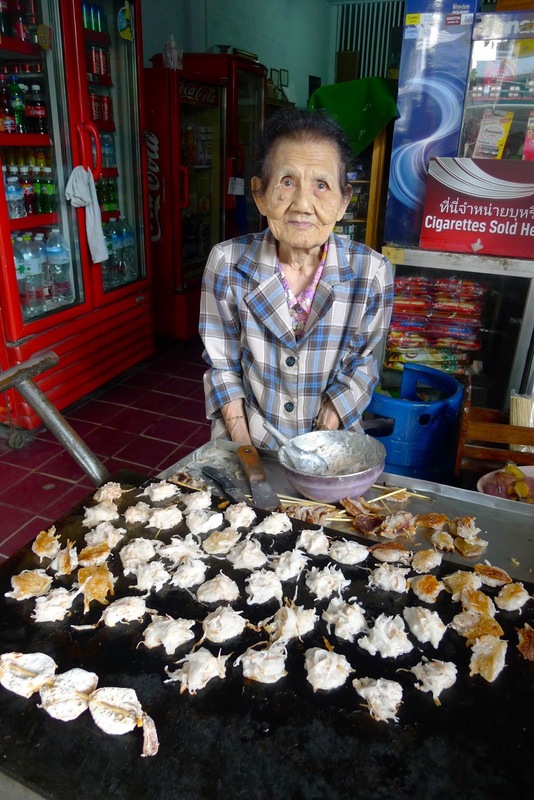 At first I thought this woman was selling crab cakes. But then I realized it was coconut. Shredded, pan-fried, and piled on a stick. Pure deliciousness. 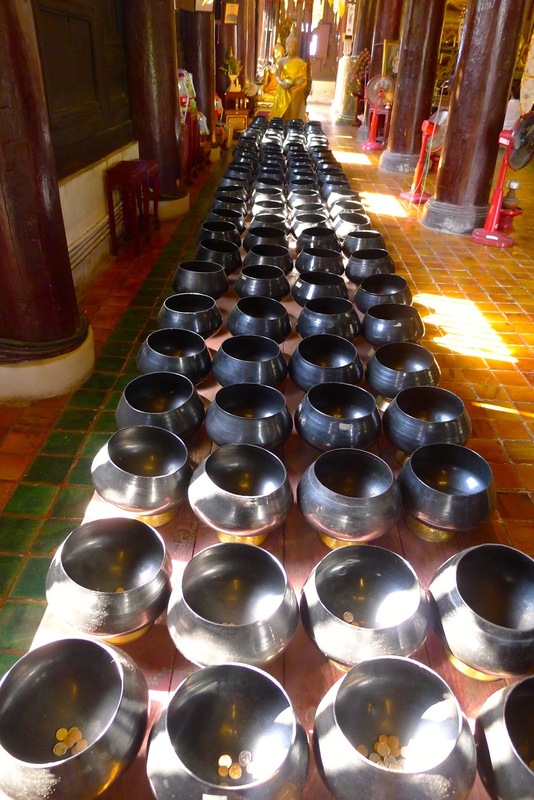 Begging bowls in the temple. The interiors of the temples are gorgeous. I can't wait to meet one of these majestic animals in person. While her mother worked, this baby stood in a walker bungee-corded to a box. 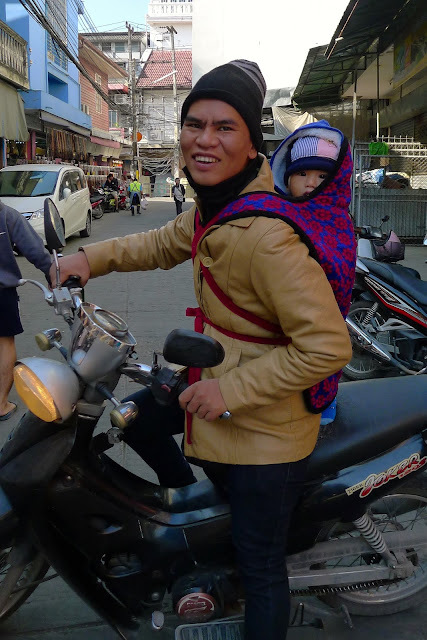 Many babies are carried on their parents' backs or in their parents' arms while being driven on a motorbike. Sunday Night Street Market. A river of people. Getting foot massages at the Sunday Night Street Market. Only 60 baht for a squid-sicle! Our new French friends invited us for a swim in their condo's rooftop pool one afternoon. I felt like I was living in an episode of 'Lifestyles Of The Rich And Famous'. Thank you, Jacques and Brigitte, for having us over (twice!) to your beautiful condo. Buddhas and temples abound in this city. One morning, we hired our guide Jack to drive us to a market up in the mountains. 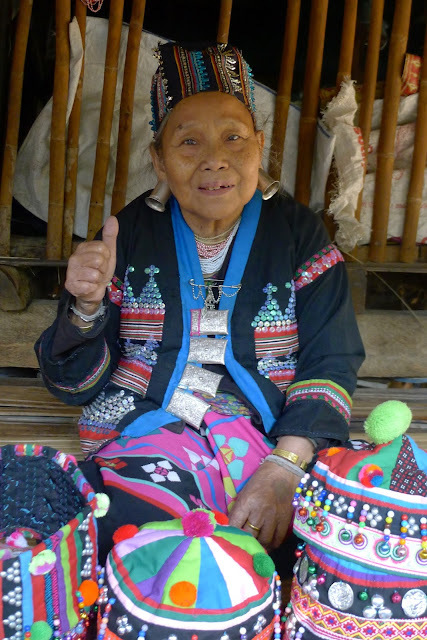 This market is run by the women of the Hmong and Karen tribes. Each item was so colourful and beautiful. I wanted to buy everything. The roosters were kept high up on a platform, away from the marauding bands of stray dogs. No, I didn't buy the hat. But I did buy a bracelet. This woman was weaving the most beautiful silk scarves. I just had to buy one. 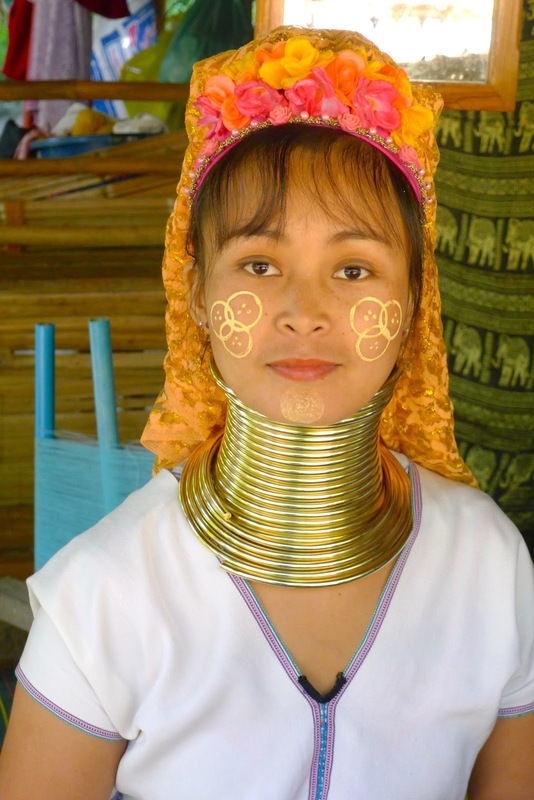 The longer the neck, the more beautiful the woman. As always, I am drawn to the children. 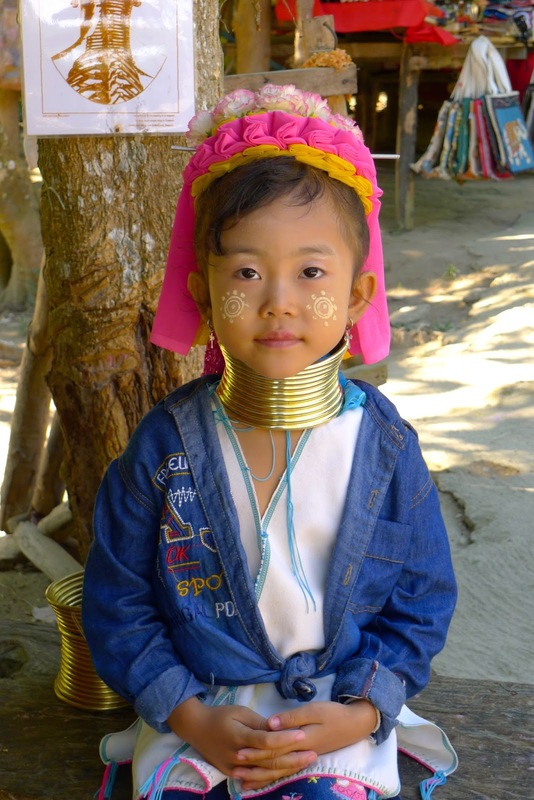 Girls start wearing neck rings at 4 or 5 years of age. Mrs. Sotham in her natural habitat. 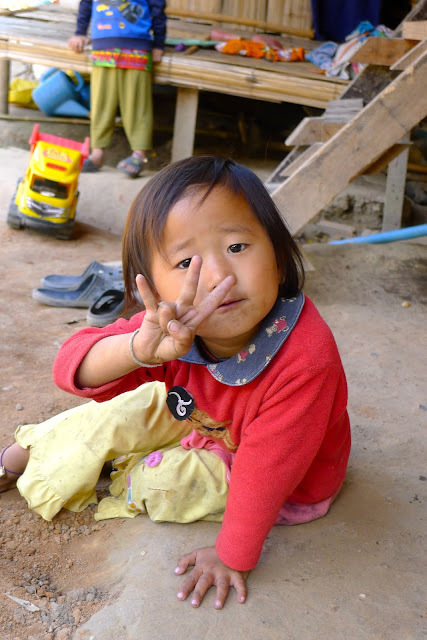 The Hmong and Karen children help out their families during the day and go to school in the evening. The universal language for "I am three years old." A bowl (or two) of soup is all one needs for lunch. Joe LOVES to shop in the food markets. Northern Thai sausage is delicious! Hanging at the local bar, just down the road from where we're staying. Thank you, Erica, for having us house-sit for you. We loved taking care of your home and your sweet dogs. Lila and Mango were consummate hostesses and very good companions. 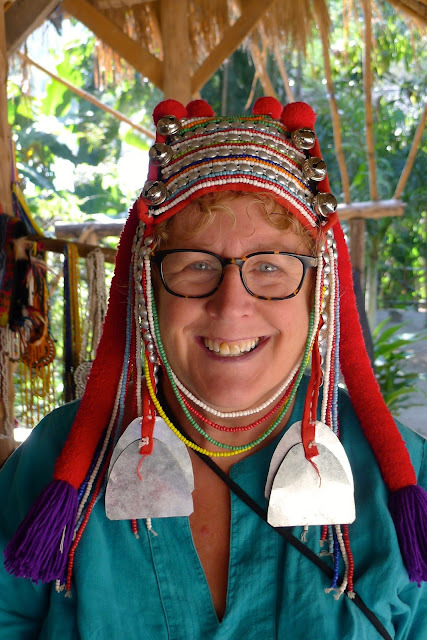 We are leaving Chiang Mai in the morning. We are taking a bus through the mountains to the town of Pai. We will spend Christmas there. Merry Christmas to you all! Enjoy every moment of your holiday with family and friends. Oh my goodness Nancy and Joe I am just loving this trip! A little disappointed you didn't buy the hat though ... would have been a great conversation piece at your "Joes Café" morning gatherings if you were to just casually walk in to the room wearing it! You two sure know how to enjoy life. So happy for you both, all the best of the Season to you! Looking forward to your next adventure. Thanks, Gail! We are having a blast here in Thailand.